Published byTrade & Leisure Publications, spol.s.r.o. In 1993, Trade & Leisure Publications introduced its first magazine called Stereo & Video – a monthly focusing on consumer electronics. In a very short time, Stereo & Video developed into a widely renowned consumer monthly and an indispensable shopping adviser. In autumn 2002, a new version of the magazine - with a DVD enclosed - was introduced to the market. In 2004, booming developments in the areas of audiovisual equipment, IT and telecommunications, plus a change in the demands of its readers and customers, saw new sections devoted to IT and multimedia appearing in Stereo & Video. In addition, since June 2005, it has provided readers with two movies on a DVD each month. 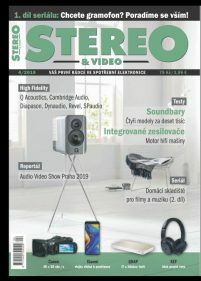 Stereo & Video offers news, reviews, tests, features, reports, how-to tutorials and a buying guide. It’s aimed at two types of readers: a majority who need help and advice on shopping, and a smaller but significant group of traditional fans and decisions makers, who closely follow the trends in consumer electronics, IT, multimedia and home entertainment. Its typical reader is male, university educated and aged 28 to 40.